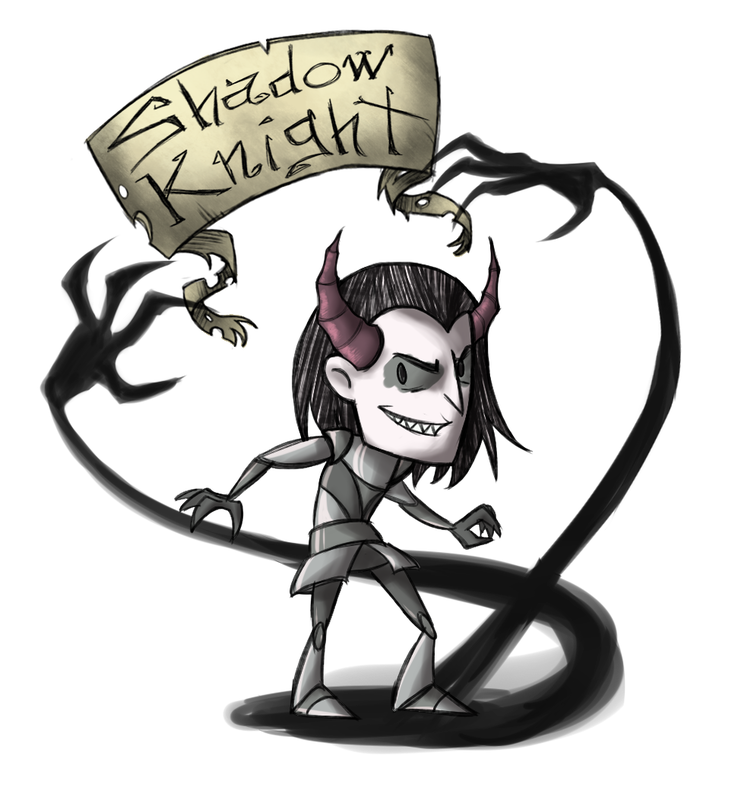 The Shadow Knight was a character included in Heroes of the Dark, a game mod for the indie game Don't Starve. 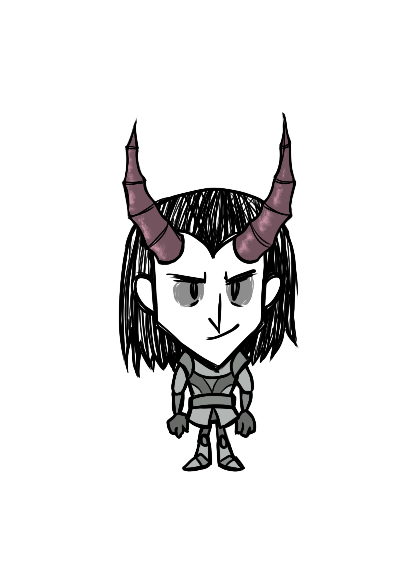 Working with the design team, the Shadow Knight came to life with their idea - an evil knight with growing horns. The coding team instructed very specific dimensions and images for animations using Spriter. 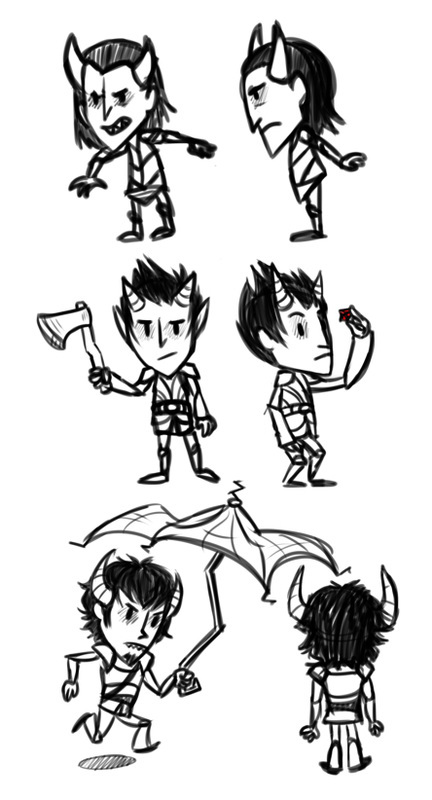 The final design emulated the trademark style of Don't Starve with vector drawings in Flash. All designs start with a concept. Based off descriptions provided by the design team, concept sketches were modified and redrawn until a final design got approved for puppet illustration. To the left is the very first sketches of the Shadow Knight. Below is the first concept of the growing horns, using a designated frame limit. Every character from the game Don't Starve has an illustrated picture in the selection screen. The Shadow Knight was no different, and after approved sketches and some final tweaks, the final, transparent image was created. It retains the right dimensions and mimics the signature character illustration style. The character is split into various parts with specific dimensions for coded animation in Spriter. 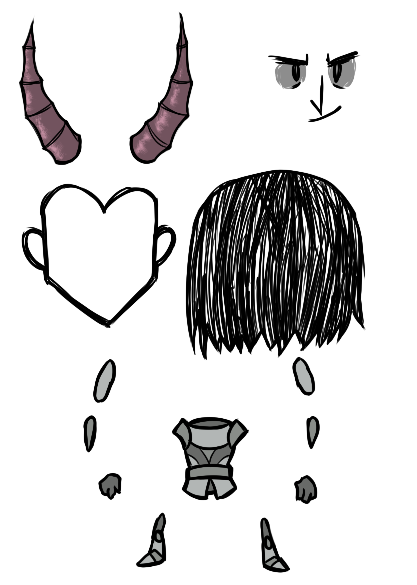 To attain the style of Don't Starve's in-game characters, these parts were all drawn as vector graphics in Adobe Flash. Each part is then published into individual images with specific names into certain folders. To the right is a visual representation of the various parts and pieces that make up a single image in-game. They would each be animated (through coding) similarly to puppets in Flash. 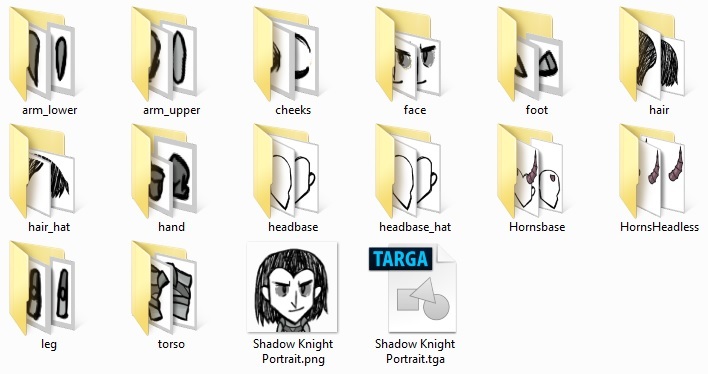 Below is the folder structure for the Shadow Knight, with all the parts and images inside. All the parts and all the pieces are zipped into a folder and the custom coding for animation is applied through the coding department. Using the provided images allows for easy positioning and importing. 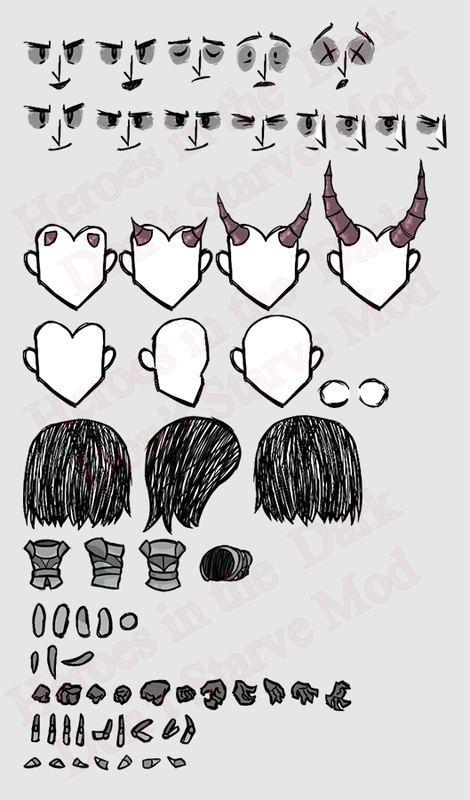 To the right is a sprite sheet, a visual display of all the parts created for the Shadow Knight character. Below is a shot of the Shadow Knight with all the parts put together as he appears in-game.